Romain Grosjean is enjoying what he describes as very positive preparations for the 2015 Formula One World Championship, even allowing himself a quick trip to his hometown to visit Richard Mille during the Salon International de la Haute Horlogerie. While he is more accustomed to visiting the Palexpo during the Geneva International Motor Show, the 28-year-old didn’t seem fazed by the timepiece takeover. Welcome to the SIHH. It’s not quite the same as the Motor Show, but you seem to be enjoying it just as much. How did Richard Mille convince you to join him? Back in 2008, when I was racing in GP2 for ART Grand Prix, we were wearing the Richard Mille logo on our helmets. That was the first time I had heard of the brand. Then I met the man himself early in 2014. We knew of each other but had never properly met. We arranged a meeting in Paris. It lasted just about 20 minutes because we were just so happy to work together. Richard Mille works very quickly, and so do I. The vision was the same. And I still have that helmet in my living room today by the way. That conversation resulted in two watch designs, including the RM 50-01 Lotus F1 Team Romain Grosjean, a highly complex model featuring a new type of carbon. The watch is very sporty. I’m very proud to have my name on it. It’s something very special when I read the name Grosjean on the watch. Of course, it has the colors of the Lotus team that Ayrton Senna made so famous. This particular watch was pre-designed when we sat down to talk about working together. But we are working on a few projects, and one in particular for which Richard Mille asked for my personal input. I have an idea or two, but they are quite complicated. Let’s just say I’m making it hard for the team but it can also be a very interesting. In fact, I’ve worn the watch in every single race since the Malaysian Grand Prix. The watch has become part of my ritual. When I put my racing gear on, I put the overalls first, then the balaclava, the helmet, and always finish by putting on my watch on top of the overalls. After that, I get in the car, and it’s all about the race. Of course, sometimes you hit a curb a little harder than you would like, and it’s happened that I’ve bumped the watch against the chassis. I think I did that in Monaco this year for example, but the watch didn’t have a scratch. It’s unbelievable what it can withstand. As the driver I’m quite jealous actually. Another driver that might know how you feel is Felipe Massa, who is also a Richard Millle ambassador. He’s worn his own Richard Mille on the track as well, and it survived a horrific crash in 2009. Do the two of you talk about watches? The first time Richard Mille presented me with a watch, Felipe was very excited for me to show him. And I did the same when he got a new one. We’re both really passionate and like to talk about watches when we get a chance. 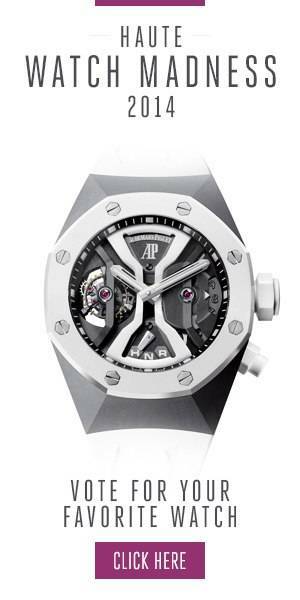 You’ll have a chance to talk watches again in Melbourne when the 2015 Formula One Championship kicks off. How are things shaping up for you this year? Hopefully next season will be much better than the last. Somehow the positive is that it can’t be worse. We’ve been working very hard in the factory this past winter to understand the issues, and improve the car. We’ve got a new power unit, and I believe that should make the car much better. Technically we’ve made a big step forward, and the car looks really good.